Wing span: 1 - 1 5/16 inches (2.5 - 3.3 cm). Identification: Upperside is glossy black with small white spots on outer third of forewing. 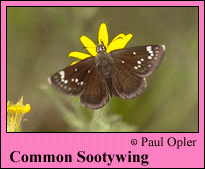 Female has more white spots on the forewing than the male, and a submarginal row of spots on the hindwing. Underside of forewing repeats the upperside; hindwing is solid black. Life history: Adults bask with the wings spread open. To find receptive females, males patrol near the ground in sunny places; mating takes place in the morning and afternoon. Near midday, females lay eggs singly on the tops of host plant leaves. Caterpillars live and feed within shelters of folded leaves. Caterpillars of the second brood overwinter in their silk-lined leaf shelters and pupate within them in the spring. Flight: Two broods; from May-August in the north, March-November in Texas. Caterpillar hosts: Lambsquarters (Chenopodium album), amaranths (Amaranthus), and cockscomb (Celosia). Adult food: Nectar from many flowers including dogbane, marjoram, oxalis, white clover, common milkweed, peppermint, cucumber, and melon. Habitat: Open or disturbed areas such as landfills, vacant lots, gardens, roadsides, fields, and pastures. Range: Central United States south to central Mexico. Strays and colonizes to southern British Columbia, northern Michigan, southern Quebec, and southern Maine. Does not occur in peninsular Florida.